Copyright � 2009 American Geophysical Union. We report on long-term surface elevation changes of the central Amery Ice Shelf (AIS) by comparing elevation records spanning 4 decades (1968�07). We use elevation records acquired with the following methods: optical leveling (1968�69); ERS radar altimetry (1992�03); GPS (1995�06); and Ice, Cloud, and land Elevation Satellite (ICESat) laser altimetry (2003�07). We compute multidecadal elevation trend (dh/dt) values at crossovers between the leveling route and each of the GPS and ICESat tracks as well as shorter-period dh/dt at ERS-ERS, GPS-GPS, and ICESat-ICESat crossovers. At GPS-leveling crossovers the mean long-term dh/dt is −0.003 m a−1, and at ICESat-leveling crossovers the mean dh/dt is +0.013 m a−1; neither trend is significantly different from zero. The data do, however, exhibit variable trends: near-zero change between 1991 and mid-1996, then thickening to ∼2003, followed by thinning ∼2003�07, with 5 year dh/dt averages exceeding ∼�1 m a−1. The changes in dh/dt pattern in mid-1996 and again in 2003 occur with unexpected speed. The ice shelf exhibits different dh/dt patterns than does the surrounding grounded ice, suggesting that surface mass balance variations or longer-term variations in firn densification processes are unlikely to be major causes. We conclude that these observed multiyear elevation changes must be due to currently unexplained or presently poorly quantified phenomena involving surface or basal processes and/or ice dynamics. 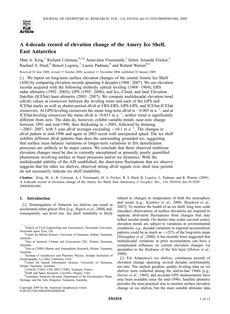 With the multidecadal stability of the AIS established, the short-term fluctuations that we observe suggests that for other ice shelves, observed strong dh/dt signals over short time periods do not necessarily indicate ice shelf instability.